People are starting to arrive in our little towns to visit family and friends for the holidays. Sometimes having lots of visitors can be a strain on the budget and mostly visitors want to contribute but don’t know what to bring you. We had quite a few visitors in our shop, straight from the airport on their way to Plett, Knysna and so forth. They specifically came into our shop because their family had told them about Red Barn. They thought they couldn’t go wrong bringing a bag or two of our products back for their hosts! Such a WONDERFUL surprise gift, so I thought I would share the idea with you. Better than them going to the Mall and standing in a queue at Woolies or the likes, right? Thank you for all the orders last week. Much appreciated! 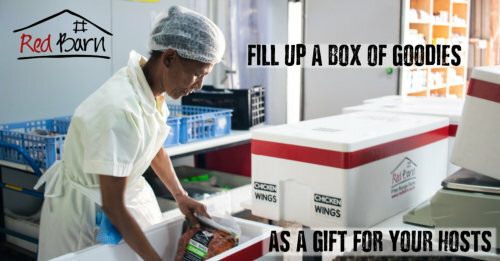 Remember, you can email Jenny with your order or call us on 044 876 0014.
https://www.redbarn.co.za/wp-content/uploads/2018/11/fill-up-free-range.jpg 261 500 Lindy https://www.redbarn.co.za/wp-content/uploads/2018/09/top-logo-red-barn-e1533460146620.png Lindy2018-11-27 09:44:522018-11-27 09:50:56Holiday Time - Get your family & friends to stock up for you!